Personalized Cosmetic Bags. Custom Printed Cosmetic Bags. If you have lotions and potions and creams and oils that all do something different, having somewhere to keep all of your cosmetics together is a must. However, we know that you don't need to take every single product with you every time you go out; that's why we offer personalized cosmetics bags in three different sizes. Made from 100% real Italian Nappa leather, in either smooth or with a 'Bison' stamped effect, or a vegan-friendly, textured faux leather alternative. Keep your cosmetics in one place with shell-shaped personalized cosmetic bags made from 100% real leather or vegan-friendly faux leather. These printed cosmetic bags are available in three sizes, large to keep the full monty in when you're at home, a mid-sized travel solution so that you can take everything you might need for a wonderful weekend away, and a mini version so that you can keep topping up your lipstick on those great nights out with the girls. 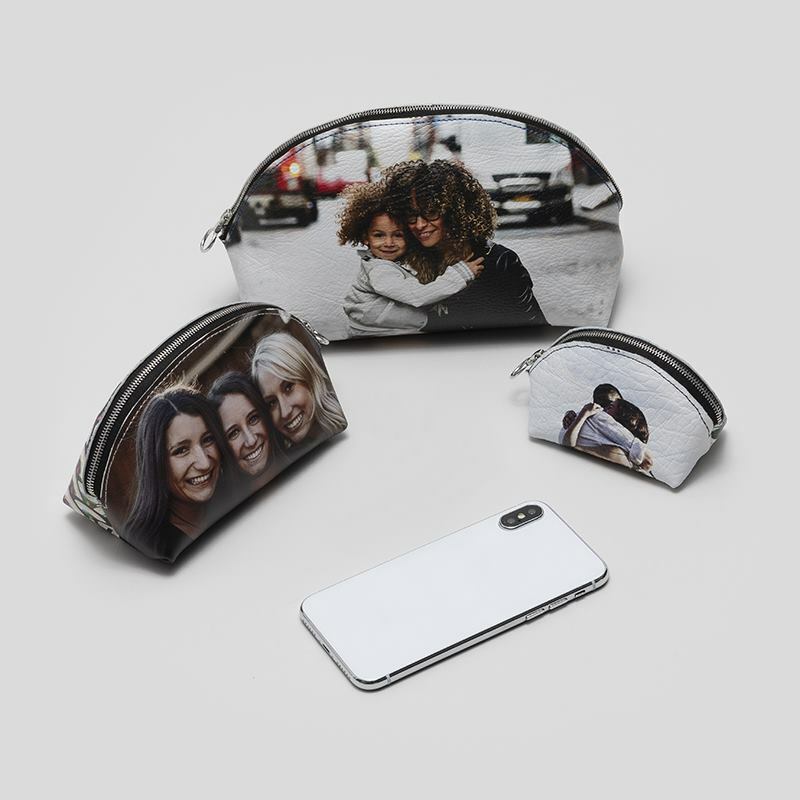 Print both the front and bag of your photo cosmetic bag using your favorite memories or the face of you and your friends. You can even add your name or initials with our design tool's built-in text editor. Large - 5.51" x 7.87" x 4.33"
Medium - 4.33" x 6.3" x 3.15"
Small - 2.36" x 3.54" x 2.16"
We use state-of-the-art leather printing techniques to infuse the inks into the fibers of the leather material, making your photos as strong as the leather that they are printed on. After our expert technicians have printed the materials for your leather cosmetic bags, our talented craftsmen cut everything to our exclusive pattern, which has been designed in-house by our specialist in-house bag and purse designer. Then our artisan seamstresses will stitch everything together using specialist leather thread, in the color that you chose in the design interface when you placed your order before our quality control department gives everything a thorough check before sending our finished shell-shape personalized cosmetic bags out to you. Or your name, or your initials, your logo, or anything that you can possibly think up. The joys of having custom printed cosmetic bags are that you can create your very own design using anything you like. From your pets to your partner, your children to your favorite band. You can create a personalized cosmetic bags however you like, and with four thread colors to choose from, which update in real-time within the design interface, you can pick the one which best complements your creation. If you can't decide on one specific picture to use, then why not pick a whole bunch and create a stunning multi-photo collage. You can do this using one of our pre-set templates, or by making your own from scratch. Perfect to keep your makeup in, and with three different sizes - full size, travel size and mini - you can create the perfect personalized cosmetic bags for any occasion, that you'll just love.